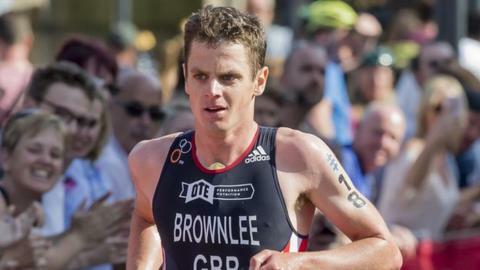 Britain's Jonny Brownlee was second in Sunday's enduro race to take the stage win in the Super League Triathlon series finale in Singapore. The two-time Olympic medallist, who won Saturday's eliminator race, finished behind France's Vincent Luis. Luis' victory saw him win the overall series title from South Africa's Henri Schoeman with Brownlee third. "I knew Vincent would be hard to beat and he deserves to be champion," said 27-year-old Brownlee. "He came into this race with fit legs. I made a couple of mistakes but I am pleased. I was the fittest but maybe not the most clinical. "I've learned a lot about racing in the heat which will help me mentally, especially in the build-up to the 2020 Tokyo Olympics." Find out how to get into triathlon in our special guide. Brownlee, Luis and Schoeman were in contention throughout the gruelling enduro race which features a non-stop burst of swim-bike-run-swim-bike-run-swim-bike-run without any break. But Luis showed his strength to pull well clear in the final run phase and although Brownlee tried to chase him, the 29-year-old Frenchman maintained his advantage. His victory meant he finished on 107 points in the overall standings, two points ahead of Schoeman, with Brownlee third on 96. "Winning the series is awesome," said Luis. "I just wanted to win the race - that was the only thing I could do. I had a great race and the form was there."